September 12, 2018 — Bravo Packing, Inc. of Carneys Point, New Jersey, is recalling all Performance Dog products, a frozen raw pet food, because they have the potential to be contaminated with Salmonella. Performance Dog comes frozen in 2-pound and 5-pound plastic sleeves. The recalled product has manufacture date code 071418. The manufacture date codes are printed on the boxes that contain the plastic sleeves, but not on the individual plastic sleeves. Therefore, if the cardboard box has been discarded, there are no unique identification numbers on the individual sleeves that allow customers to determine that they possess the recalled products. If you purchased this product since July 14, 2018 and cannot determine whether it is affected by the recall, the FDA recommends that you exercise caution and throw the product away. Salmonella can cause illness in animals eating the products, as well as people who handle contaminated pet products, especially if they have not thoroughly washed their hands after having contact with the products, infected animals or any surfaces exposed to these products. Rarely, Salmonella can result in more serious ailments, including arterial infections, endocarditis (an infection of the heart muscle), arthritis, muscle pain, eye irritation and urinary tract symptoms. People who have these symptoms after having contact with this product or an animal that has eaten this product should contact their healthcare providers. Some pets will have decreased appetite, fever and abdominal pain. Pets exposed to contaminated food can be infected without showing symptoms. Infected animals can also shed Salmonella through their feces and saliva, spreading pathogens into the home environment and to humans and other animals in the household. No human or animal illnesses have been reported to date. 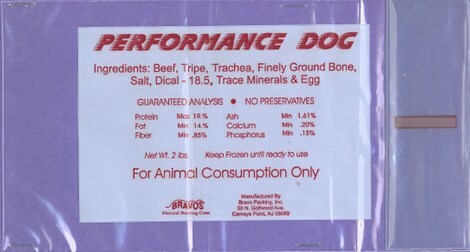 Bravo Packing, Inc. is voluntarily recalling this product after a sample of Performance Dog, collected during an FDA inspection, tested positive for Salmonella. Performance Dog generally works with the distributor Tefco, located in Brooklyn , New York, that fills orders to brick-and-mortar retail stores or to consumers directly. Consumers with questions should contact Bravo Packing, Inc. at 856-299-1044 (Monday thru Friday, 6 AM to 2 PM, Saturday 4 AM to 9 AM ET) or through the company’s website at www.bravopacking.com.